BC has some of the longest-serving family resource programs in Canada. 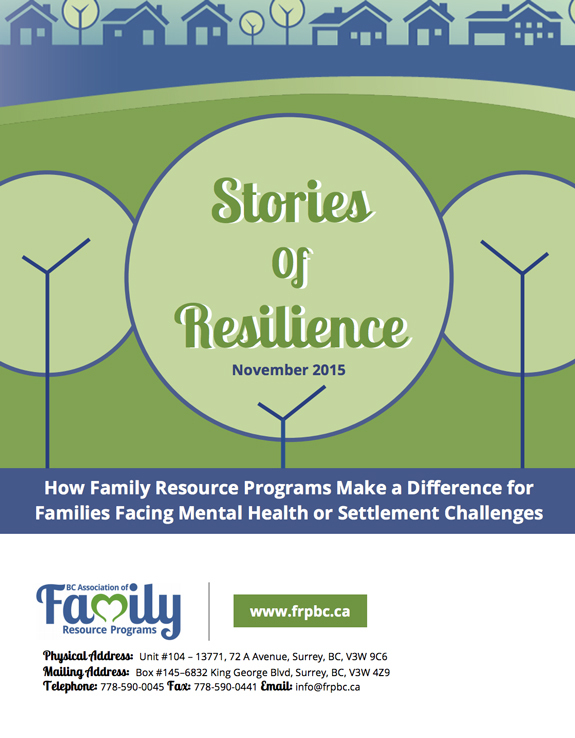 The authors of the BCFRP paper, Stories of Resilience: how Family Resource programs make a difference for families facing mental health or settlement challenges, published in November 2015, note that family resource programs in BC now support families with young children in over 250 communities throughout the province, with different looks, but consistent aims and standards of practice. These programs offer a wide range of supports to families and caregivers raising young children. They point out that “drop-ins and other program components are designed to foster positive parent-child interaction, build social connections for families and nurture healthy child development” and are characterized by a “welcoming, strengths-based approach”. Recently, the BCFRP undertook a study of “whether and to what extent these services go beyond primary prevention and promotion for the general population to address the complex needs of families with significant challenges”.The qualitative study was conducted through focus groups involving 31 participating adults from six family resource programs in four Lower Mainland/Fraser Valley communities. The paper focuses on these two conditions, and examines each separately, in order to investigate the ways that family resource programs are able to respond to the specific circumstances that affect participating families. Was invaluable in helping them to connect with other people, build networks, and feel accepted as members of the community. In partnership with policy makes, funders and researchers, the BCFRP should explore the current and potential impact of family resource services on other challenged groups, such as: families with a member who is mentally or physically disabled; adoptive parents; families living in poverty; and LGBTQ parents. In acknowledgement of the untapped potential of family resource programs to respond effectively to complex challenges facing families in BC, funders and administrators should consider expanding the expressed mandate of these programs, including adequate and secure funding for family resource programs; expanded staff training; and awareness-raising of the capacity and effectiveness of family resource programs in assisting families with diverse and complex challenges. Government policy makers and funders should work to reduce barriers to participation for BC families who wish to access family resource services, for example, by developing a branding and promotion campaign in multiple languages, and by ensuring there are enough service locations to respond to growing numbers of participants without overcrowding. Participating families offered some enlightening comments about their search for services. Most focus group participants had at one time been either an isolated, depressed mom or were immigrants, or both. As seen by the issues described above, their needs were multiple and complex and they reported challenges in finding appropriate community services for themselves and their children. Some parents had initially sought out programs primarily for their children. Others had looked for support or a learning program for themselves. The paper notes that, often, finding the family resource program involved a circuitous route and contact with a wide variety of programs first. Some had come through other community programs,(e.g. Nobody’s Perfect), or through attendance at school-readiness programs, or through referral from professionals or community members. Due to their challenges, families in these two groups [those with mental health or settlement issues] tend to bring complex issues with them to community programs. The study’s participants reported that some programs and services focus on singular issues (such as school-readiness or language training) and therefore fall short of meeting their multiple needs. Being a newcomer to Canada, not having command of English or being depressed created barriers to finding appropriate resources. These conditions fostered uncertainty about reaching out and exploring, for fear they did not belong. Participants needed help to find a family resource program and information, often in a language other than English, to explain it. These anxieties meant that they particularly appreciated a friendly welcome, free of pressure, and a relaxed introduction and orientation to the setting, the people and the services within. The significant stress in their lives meant that the paramount initial need for many was simply relaxation and relief from the 24-7 burden of child care. The empathetic inquiry and listening from staff and trained volunteers proved vital and therapeutic to parents suffering stress, depression and loneliness. Just as important was the chance to connect with other families to build friendships, and support and mutual aid circles. Also highly valued, especially for first-time parents or parents with challenging children, was the opportunity to observe and trade tips, or even just sympathy, with others on coping with parenting. Knowledge, information and skills gained through informal interactions and through courses, workshops, support groups and training at the FRP were consistently rated as high quality and invaluable, even life changing. Much of this learning related to child behaviour, child development and parenting. However, knowledge and skills gained went well beyond this part of family life to include broader coping, life and employment skills. Practical assistance, whether with paperwork, navigating systems, finding needed equipment, addressing legal and quasi-legal issues, facilitating referrals for special needs and myriad other individual concerns was yet another way that family resource staff stepped up to assist participants. A proportion of the focus group participants acknowledged that they initially came to the family resource program for their children. They wanted a safe, rich environment for them to play and socialize with other children and several found it especially helpful that they could bring their young children of different ages and stages to the same place. However, while they started attending for their children, they continued on for themselves. The involvement of a number of the participants with the family resource program extended over quite a few years, through the early childhood of several children. As quotes above indicate, the centre came to feel like their second home. The paper is free to download from the FRPBC website.